Wattenberg: Santu Mofokeng’s The Black Photo Album/Look at Me: 1890–1950 [Steidl, 2013] and Guy Tillim’s Joburg: Points of View [Punctum, 2014] and Petros Village [Punctum, 2006] are almost like novels or concept books—they’re keys to unlocking a larger body of work. But younger artists have also used the photobook to communicate urgent social issues, such as prison conditions in Mikhael Subotzky’s Beaufort West [Chris Boot Ltd., 2008], and the stories of LGBTQ individuals in Zanele Muholi’s two books from her series Faces and Phases [Prestel, 2010 and Steidl and the Walther Collection, 2014] and Sabelo Mlangeni’s Country Girls [Stevenson Gallery, 2010]. Law-Viljoen: There is a very clear sense of history in all of the photographers you mention, and not just political history, but also photographic history. They have inherited a political and historical narrative, as well as the desire to tell “stories”—not only about the past, but also about prevailing conditions of inequality, poverty, and the long reach of apartheid. But at the same time, these photographers have broken with the forms that those narratives have taken. Wattenberg: How do you see the contemporary photobook in South Africa responding to the past, but also breaking new ground in form and content? Law-Viljoen: Muholi’s extraordinary achievement, in Faces and Phases, is her ability to represent the experience of a marginalized group of people in society while at the same time suggesting the dynamic agency of the individuals in this group. This is emblematic of a profound psycho-political shift in South African art in general since the end of apartheid. The focus for many artists and photographers is less on people as representatives of a system or group than it is on the individual, as having their own, unique experience of trauma and as agent in their own life. Wattenberg: When you opened Fourthwall Books, what types of photobooks were you most interested in publishing? What makes a book a Fourthwall book? Law-Viljoen: We were interested in beautiful and unusual books that told unusual stories and did not rely solely on the singular image, or on a series of singular images, for their impact. Rather, we wanted to make books that were able to sustain a long engagement with their subject matter—often, though not always, by combining text and image in interesting ways. Wattenberg: How do you choose your projects? Do you work with local designers in South Africa? And where do you print your books? Law-Viljoen: The projects that appeal to us usually are the ones that make little business sense—hence nobody else will touch them! We’ve always done our own design. Oliver Barstow was the cofounder of Fourthwall, and he designed all the books up to 2015. Since then our designer has been Carla Saunders, and we’ve sometimes had other designers work on projects—but all have been South African. We have printed books in South Africa, China, Germany, and Italy. Wattenberg: You’ve published several books about Johannesburg, including UP UP: Stories of Johannesburg’s Highrises , Writing the City Into Being , and Terry Kurgan’s Hotel Yeoville , which seem to dissect the city, its communities, and its architecture in words and pictures. Why is Johannesburg an enduring photographic subject? What do your books—which privilege writing—offer to the ongoing portrait that artists are collectively making of Johannesburg? Law-Viljoen: We never set out to make books about Johannesburg, but I suppose once we had made a couple, we came to be seen as the publisher of Johannesburg material. Joburg is vibrant, ugly, beautiful, violent. It has lots of hidden pockets. It’s very fragmented and divided. It’s Goldblatt’s city, it’s Mofokeng’s city, it’s Peter Magubane’s city. But it also belongs to young artists and it features in quite diff erent ways in their work. The historic and hugely important Market Photo Workshop is here—so it’s the place young photographers test their mettle. I suppose it suits us as a subject for books because it has so many stories in it, and we like stories with funny beginnings and open endings. Wattenberg: Lisa King’s captivating book Sometimes I make money one day of the week  is an account of the traders working at the Zimbabwe Stock Exchange. Why were you attracted to this project? Law-Viljoen: Lisa’s book was odd—not obvious material for a photobook, or in fact for any book. She spent a number of years taking photographs in the last manual call-out stock exchange in the world, which has now been digitized. The pictures were of a bunch of very ordinary-looking people in a very ordinary, tatty room. But it was an unexpectedly interesting story. And it came with the writer Sean Christie. He had not yet written the text when we first saw the images, but we knew his work—he’s a writer who always takes the road less traveled. And both Lisa and Sean stuck with this odd little story for a long time. They were determined to show us (and readers in general) how interesting they found it. In a way it’s the perfect Fourthwall book. 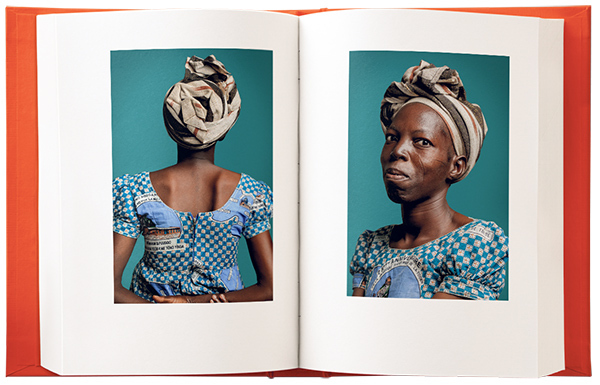 Wattenberg: One of your most recent titles is the Ivorian photographer Joana Choumali’s Hââbré, The Last Generation . How did you learn about Choumali’s work? And could you speak about the design—the minimalist approach, the typography, and the bold choice of a bright red cover? Law-Viljoen: Joana’s book was nominated for the 2016 Fourthwall Books Photobook Award, which is the first such award on the African continent. For Hââbré, we wanted to represent Joana’s vision of her sitters as important bearers of an old tradition—facial scarification among people from Burkina Faso who have migrated to Ivory Coast. At the same time, however, we did not want to over-romanticize them. So we decided that, by placing the interview before the image, we would make the reader “listen” to the subject in the portrait before they saw them in the image. We made the text as visual as we could: a large, bold font that prefaces each pair of images. As for the cover, the red is a foil to the cool blue background that Joana used in her portraits. It’s on the other side of the spectrum to the backdrop, but both colors have a lot of black in them. Wattenberg: What are the challenges of publishing photobooks in South Africa? What are the rewards? Law-Viljoen: Funding is the primary challenge. The second challenge, not unrelated to the first, is the size of the book-buying market. We have to balance our desire to make beautiful books against the realities of life for most people in South Africa. We often ask ourselves about the relevance of our books, the relationship of our books to the social world we live in. We always address ourselves to these problems in the books, but the end result is out of reach for many who might otherwise like to buy them. Wattenberg: Still, by making books, you provide a measure of cultural preservation, and you also show young photographers the many ways they might communicate their ideas and vision. Do you see a growing community around photobooks in South Africa today? Law-Viljoen: We see a greater awareness of the possibilities that a book provides for a photographer, and a growing sophistication in readers and photographers. This suggests a wider engagement with the world of books and photography outside of South Africa, which is a good thing. Perhaps we’ve also contributed to this, through the kinds of books we’ve chosen to do and the design choices we’ve made over the years. Bronwyn Law-Viljoen is an associate professor and head of Creative Writing at the University of the Witwatersrand, Johannesburg, as well as editor and cofounder of Fourthwall Books. Her debut novel is The Printmaker (Umuzi, 2016). This article, which originally appeared in The PhotoBook Review #12, Spring 2017, is produced in collaboration with Contemporary And (C&) – Platform for International Art from African Perspectives.